Customer experience pioneer Jeanne Bliss shows why “Make Mom Proud” companies outperform their competition. Her 5-step guide to customer experience and culture transformation makes this achievement possible. Bliss urges companies to make business personal to earn ardent fans and admirers, by focusing on one deceptively simple question: "Would you do that to your mother?" “Make Mom Proud” companies give customers the treatment they desire, and employees the ability to deliver it. They turn “gotcha” moments into “we’ve got your back” moments by rethinking business practices, and they enable employees to be part of the solution to fix customer frustrations. Bliss scoured the marketplace seeking companies who excel at living their core values, grounded in what we all learned as kids. She offers a five-step plan for evaluating your current behaviors and implementing actions at every level of the organization. Understand how you are hiring, developing and trusting employees to bring the best version of themselves to work. Vail resorts, for example, the world's largest ski resort operator, banned the three words "Our policy is..." from their vocabulary, freeing employees to take spirited actions to deliver "the experience of a lifetime." Learn the eight key frustrations that bind us as customers (waiting, fear, anxiety, the black hole of no communication, etc.) and how to apply actions from companies who are delivering a seamless, frictionless and easy experience. Determine if your focus is on helping customers achieve their goals – and evaluate how that is fueling your growth. Canada's Mayfair Diagnostics, for example, spent over a year studying the emotions of patients entering an imaging clinic, so they could redesign their welcome to deliver warmth and caring over procedure and process. The newly designed clinic achieved profitability in record time. Learn how companies who do the right thing rise above the competition. Virgin Hotels, for example, named #1 U.S. hotel by Conde Nast Reader's Choice Awards, walked away from price gouging at the mini bar, so you'll never pay more for that Snickers bar than what you'd pay at the corner market. Evaluate your current company behaviors and identify the key actions that you can begin immediately. With 32 case studies and examples from more than 85 companies, this is a practical and easy to follow guide for your experience and culture transformation. Filled with comics to snapshot our experiences as customers, a “mom lens” to reflect continuously on your performance, and a “make-mom-proud-ometer” quiz – the book makes Bliss’s approach accessible and approachable. 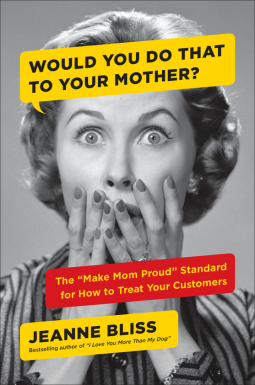 Join the movement to #MakeMomProud by applying this book across your organization. Whether you're contemplating your company's returns policy, its social media presence, or its big-picture strategy, this approach will help your company anticipate both employee and customer needs, extend patience, and show respect at all times.